Only a few points separated the top three entering the last race of the Spring segment. Jeff Ward’s consistency and amazing run of top three finishes pays off with the win. 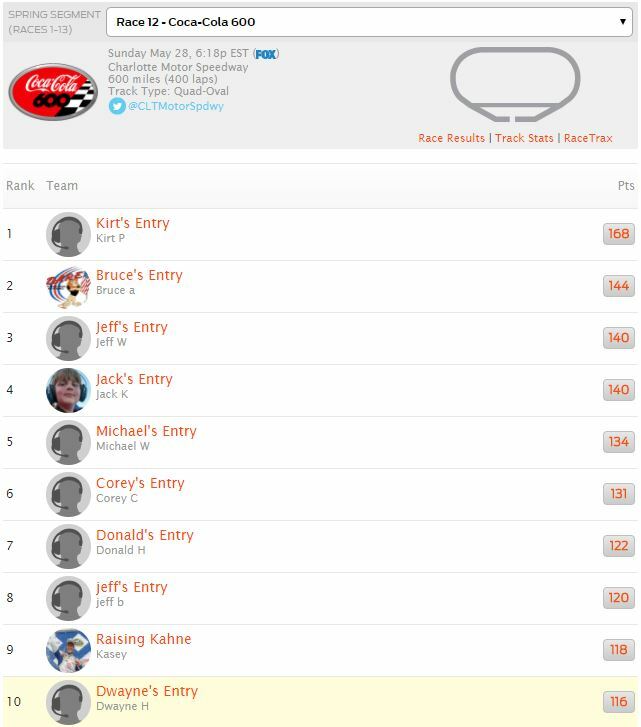 Congrats on winning the BigDawgzGaming Fantasy NASCAR league Spring segment! The check is in the mail… so to speak lol! Just remember everyone. The scoring for the next segment starts over this week. Anyone can win the Summer segment. Good luck all! How can Jimmie Johnson not be considered one of the best drivers ever? After starting from the back of the field due to a last minute gear change, he drove to the front and won the freaking race. With number 13 in the books Bruce Alexander took the top spot. He has been on a roll the last few weeks. With 193 points it was not even close. Kasey Muench’s team is one to watch with another top three finish at 181 points. Kasey appears to be a chip off the ole block. Greg Britt overcomes some driver issues to round out the top three with 178 points. No quit in Britt this week! Holyschmoley Kirt Pequignot. There has been no stopping his team. 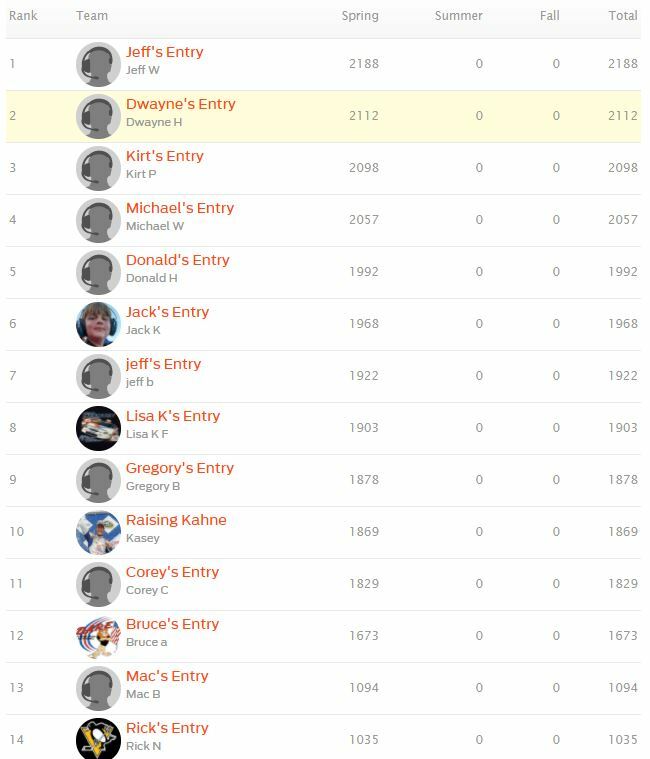 Kirt gets another win this week with 168 points. Bruce Alexander pulls off a second place with 144 points. 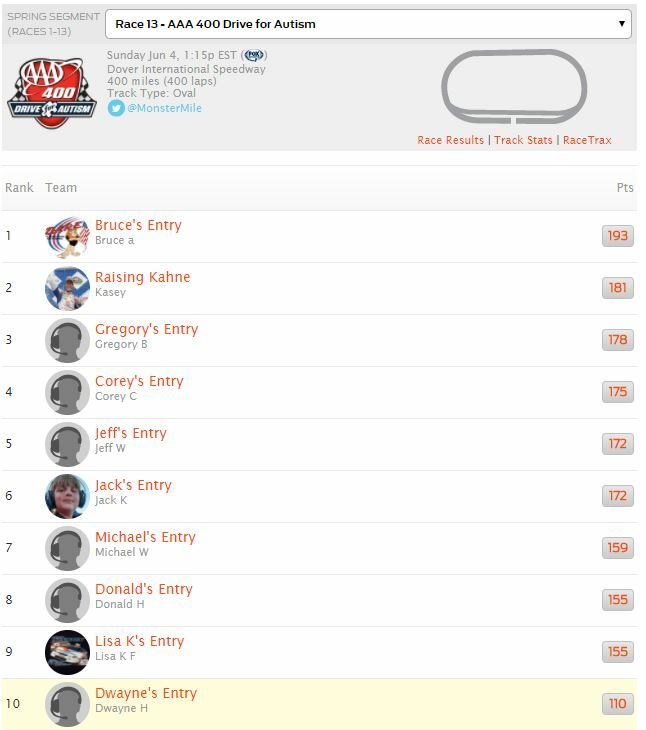 Jeff Ward’s team has been the model of consistency grabbing a third place with 140 points. Next week ends the Spring segment. Only 14 points separate the top three teams!